I’ve been a fencer for nearly 12 years [Dave Seliger of CORE77] (DCFC, represent). The thing that’s always bugged me about the sport is how little or poorly fencing is portrayed on TV and in the movies (Sunshine being the one exception). Sure, we got to see women’s sabre at the Beijing Olympics in 2008, but you know there’s something wrong when there are entire TV channels dedicated to poker. Luckily, Holly Buechel (who happens to be the #5 women’s epeeist in the US) took matters into her own hands and filmed this absolutely gorgeous fencing short. 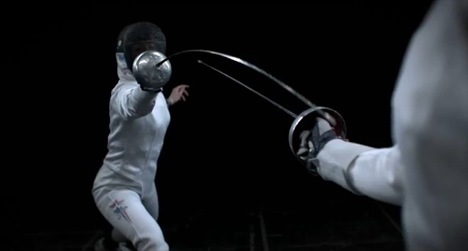 The film shows fencing at full speed, then slows down to show the underlying beauty of the sport. Although spectators never see fencing at this speed, fencers often see their opponent’s actions in slow-mo. Buechel has figured out a way to show what fencing truly looks like. Moral of the story: let Buechel film fencing at the next Olympics (unless she’s in it)!